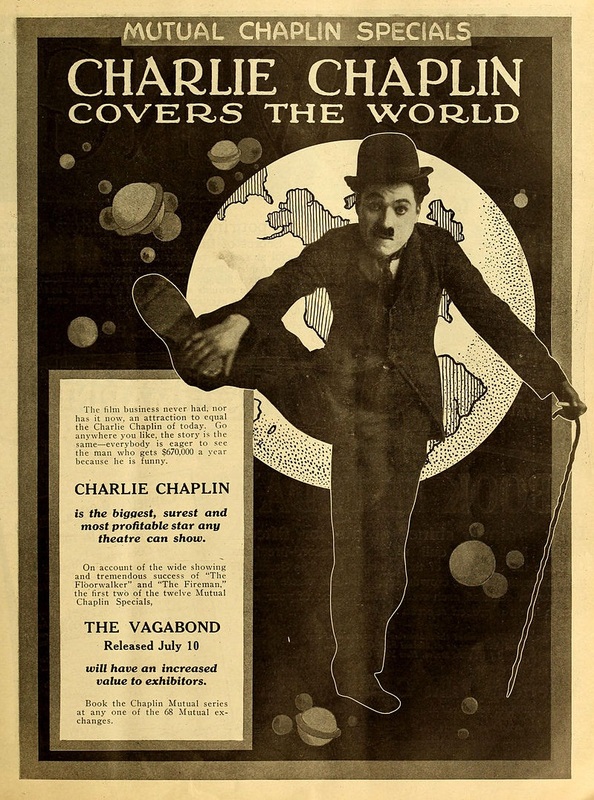 Charlie Chaplin’s character returns to his more lovable behavior with this Mutual release, apparently a kind of follow-up to “The Tramp.” Both in terms of filmmaking and character, this movie shows how far he came in so short a time. 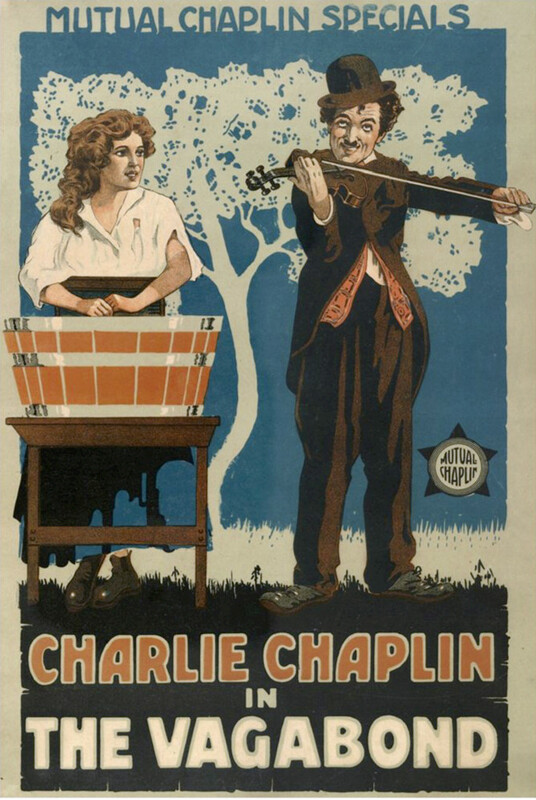 The movie opens with Charlie, in “Little Tramp” getup, walking out of a bar. 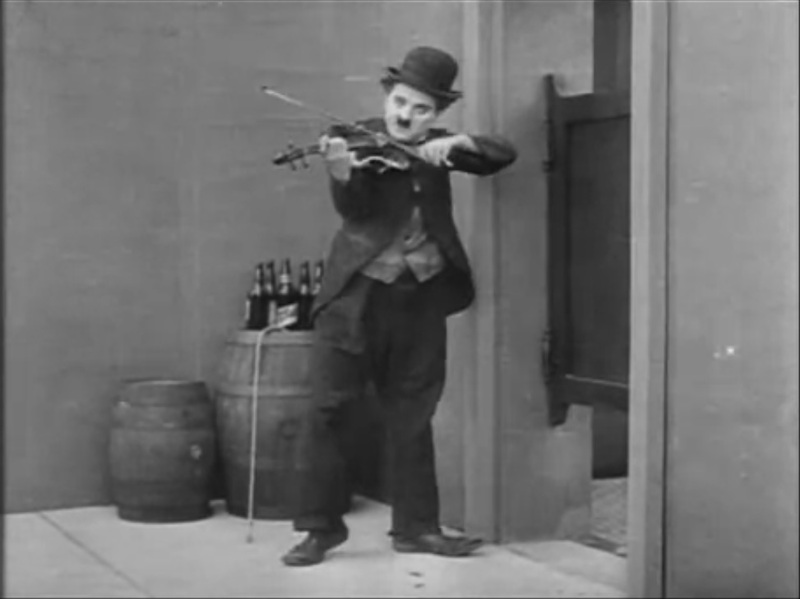 At first, we expect that he has returned to the character of the “funny drunk,” but after a moment, he pulls out a violin, showing his real reason for being there. Outside the door, he plays his instrument for the entertainment of those inside. While he is playing, a full band walks up to the other entrance to the bar, and starts playing. We see the patrons of the bar, enjoying the band’s popular tunes, singing along, and raising their glasses to the tune. Charlie finishes his piece and goes inside to ask for donations for the music he played. Enthusiastic about the band, several patrons give him coins. Then the band leader (John Rand) comes in to ask for money, and the patrons are incensed: “What, again?” The band leader figures out that Charlie has “stolen” their money and confronts him. Not understanding, Charlie asks him for a donation. The Band leader hits him and a fight between them turns into a chase, which includes, first, the band leader, then the band (Charlie steps on a drum in trying to escape), and then everyone in the bar (Charlie grabs a drink while they all run after him). He finally evades his pursuers and makes his way to a gypsy camp. Here, he plays for a girl (Edna Purviance) who is doing the washing. She accelerates and decelerates her work in time with his playing. At the end, he gets so enthusiastic that he falls over into a water bucket. She comes over to help him, and her cruel stepfather (Eric Armstrong) sees her slacking off and making time with this stranger. He now grabs Edna and drags her over to the fire, where all the other gypsies are and whips her in front of the crowd. Charlie, seeing this, builds up his courage and knocks the man out with a club. He then manages to knock out each of the gypsies in turn, takes Edna back to the caravan and steals a wagon to ride off with her. The next morning, Charlie awakes on the ground, having given the wagon’s sleeping quarters to Edna, and he helps her wash up and prepares breakfast. Meanwhile, Edna takes a walk and encounters a handsome artist (Lloyd Bacon), who asks her to model. She complies, shyly at first, then invites him back for breakfast, which Charlie isn’t entirely happy about. The painting of Edna winds up in a gallery, where it is seen by her wealthy mother, who recognizes her from the birthmark on her arm as the little girl that was stolen by gypsies! Edna’s mother and the artist return to the camp in a limo, and she agrees to go with them, leaving Charlie, saddened and alone, behind. Suddenly, Edna’s heart tells her that her true love isn’t for the artist, and she cries out for the car to stop and turn back. She runs and embraces Charlie, telling him, “you come too!” They pile into the car and go off to a new life together. As with “Police,” Charlie’s character in this movie is a victim of the cruel world, rather than a perpetrator of violence for its own sake. His theft of the money from the band is unintentional, and he does not start violence against them on purpose. With the gypsies, he is violent only in defense of Edna, who is being bull-whipped unjustly. He does not act in violence or even discourtesy towards his romantic rival. In short, he is a totally sympathetic character once again. The ending is a stark contrast with “The Tramp,” in which he leaves at the first sight of any competition. Here, he holds out hope and winds up winning. Unlike other Charlie-Edna romances, the decision is left to the girl, and she makes it based on her true feelings. I find the ending effectively dramatic and moving, in spite of its presence in a manic comedy. Chaplin’s direction is improving this year as well. He seems to have made a real discovery in Lloyd Bacon, who served as his double in “The Floorwalker,” Edna’s father in “The Fireman,” and the suave artist in this movie. He demonstrates range, comedic talent, and solid dramatic acting. 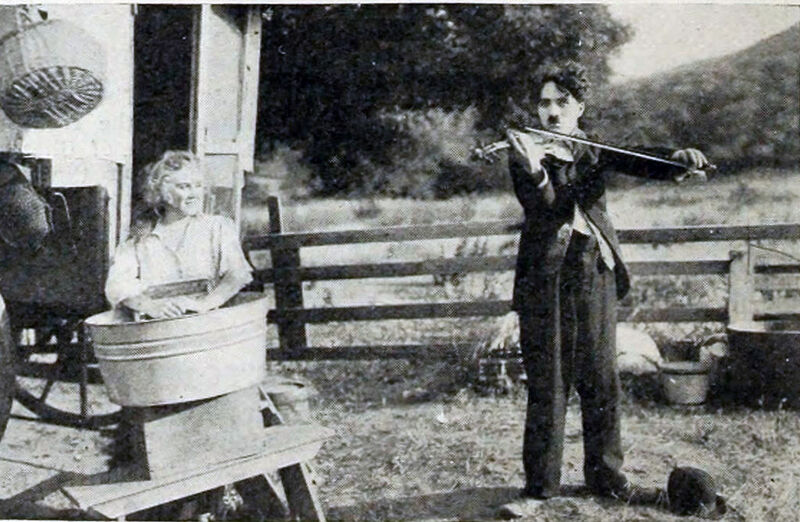 Bacon had small roles in some of Chaplin’s early Essanay films, but had mostly worked with “Broncho Billy” Anderson until Chaplin moved to Mutual and somehow convinced Bacon to follow. He would go on to become a successful director in the talkie era, making movies like “42nd Street” and “Action in the North Atlantic” with Humphrey Bogart. Although his role in this movie is fairly “straight,” it is an important role, and Chaplin had to trust the actor to be able to pull it off without trying to be funny. I also want to take a moment to mention Roland Totheroh, who started working with Chaplin at the end of his career at Essanay and stayed with him to film all of his later shorts and major features up to “Monsieur Verdoux” in 1947. Totheroh has a somewhat better style for these more sophisticated movies than Harry Ensign, who worked fast and fit the more manic pace of earlier Chaplin. Camera angles are more carefully considered, and set-ups are not based on the “square” framing of the earlier period, although for editing purposes we still have frames that define edges of spaces that characters will move through, allowing funny business when characters in one frame do not know what takes place in the other. This is a long review, by the standards of this blog, but there’s one more thing I’d like to point out, which is the emphasis on “sound” and its importance in silent movies. Charlie is a musician, and how other characters react to his playing is an important screen element, although the audience cannot hear what it “really” sounds like (a good soundtrack can make up for this, of course). This was also the case in “The Fireman,” in which alarms and phones ringing are key plot devices. This is characteristic, in my opinion, of what I’m calling the “Silent Classical Period,” in which directors and other creative people had come to see silent movies as an art form of their own – one which included sound as an implied element, but not a direct one. That’s not to say no one had ever done it before 1915 (there are alarms in “Life of an American Fireman,” for example, and reactions to gunshots in “The Great Train Robbery”), but its use is increasingly explicit and sophisticated during this period.